And now from Darden, those wonderful folks who brought you The Olive Garden and Red Lobster comes…a really good restaurant? Yes, it’s true. Seasons 52 is a new chain that started in Florida with two locations in the Orlando area, one each in Palm Beach Gardens, Boca Raton and Ft Lauderdale, with plans for the next two in Atlanta. It’s a casually sophisticated adult environment, with no item on the menu over 475 calories, featuring a terrific wine program. Physically, it’s a warm, contemporary design using accents of wood and stone as well as soft lighting. It’s the menu and the wine list, however, that will keep you coming back. The name Seasons 52 refers to the fact that every week of the year the menu features the freshest, best-tasting items available, changing to take advantage of what’s best in each season. The summer menu changed in September to an autumn menu, and will change again in January. Most dishes are either grilled or roasted over open-fire oak-burning grills to create great flavor without the need for heavy sauces, and to keep within the 475 calorie limit. They proudly state that there are no deep fat fryers in Seasons 52. The menu is influenced by the recommendations for nutritional balance set forth by the National Institutes of Health, placing an emphasis on whole food carbohydrates, beneficial oils, lean meats and fish high in Omega-3 fatty acids. This is a place where it’s fun to just order a bunch of appetizers and a few glasses of wine. Just be aware that as the plates pile up, so do the calories. 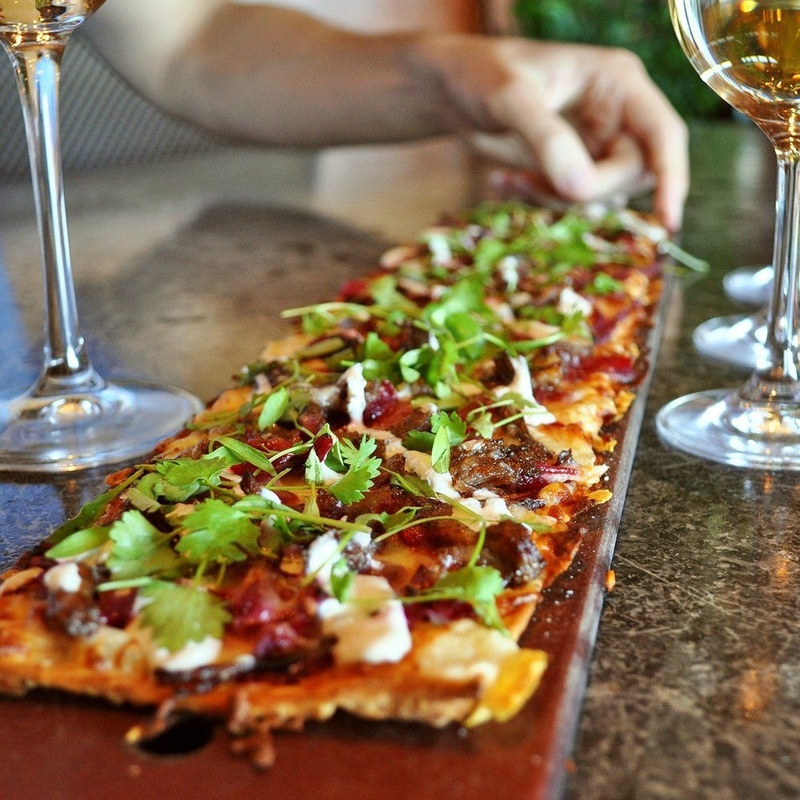 Flatbreads are very popular and very good. The Spicy Chipotle Shrimp Flatbread with grilled pineapple and fire roasted red peppers ($7.95) is a winner, as is the Reuben Flatbread with lean corned beef, caraway kraut and melted Swiss cheese ($7.25). Other appetizers included a Baby Spinach Salad with fresh pears, candied walnuts and crumbled blue cheese ($6.25) which is definitely recommended; tasty Shrimp and Crab Stuffed Mushrooms with roasted garlic sauce and caramelized Parmesan ($8.75) which is cleverly served on an escargot plate; Chicken Skewers grilled over mesquite and served with roasted corn salad and avocado ($6.95)--- fine but not exceptional. 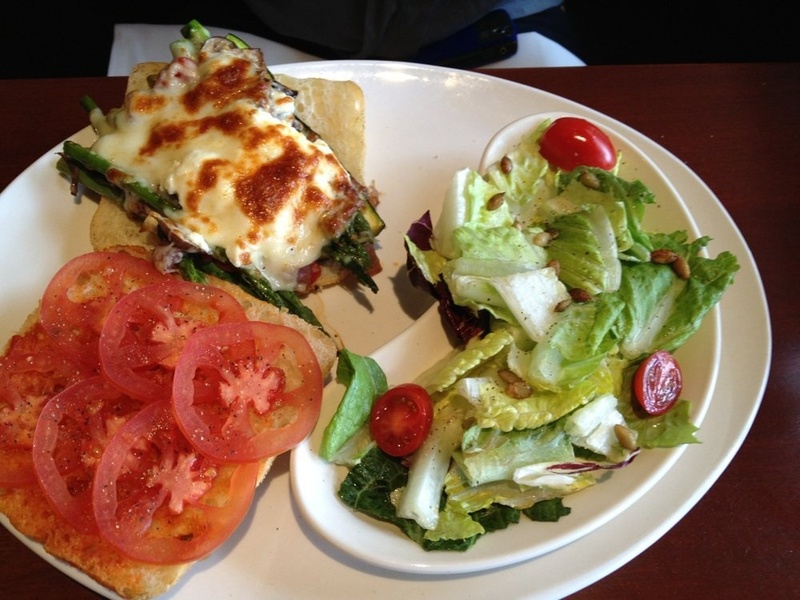 Luncheon plates are primarily salads and sandwiches that are in the $8 to $12 range. The dinner menu is heavy on fish such as Blackened Mahi Mahi, Cedar Plank Roasted Salmon and Grilled Boneless Ruby Trout. There is also a Chicken Breast, a Pork Tenderloin, and Boneless Quail Breasts with maple whiskey glaze. Prices are $16 to $21. There are daily soup and vegetable specials. Vegetarians, vegans, and people on low carb diets are accommodated. Good food is an essential part of a good wine experience, but the wine itself is our real focus. To learn about this I met with George Miliotes, Director of Beverage and Hospitality, who is a leader of the development team that is behind the project. In the first five minutes with George it became obvious that Seasons 52 is all about wine, and that he was passionate about the subject. He has worked in Chris’ House of Beef and at California Grill at Walt Disney World, earning awards for his wine lists at both places. He’s a Certified Wine Educator and is one step from becoming a Master Sommelier. He is a true wine guy, and the fact that he’s rolling out the Seasons 52 restaurants says a lot. The wine list has over 100 wines with more than 70 offered by the glass. It covers the whole world, as well as all price ranges. It’s designed to compliment the menu but also to make it easy for people to try new things and learn about wine. There is no up-charge for wines by the glass. A glass is ¼ of a bottle (conveniently measured by pouring to the top of a “52” inscribed on the glass), and costs ¼ of the price of a bottle. When you order a glass the bottle is brought to the table so you can examine it if you wish. You can get a small taste of wines before ordering them, just like ice cream at Baskin Robbins. 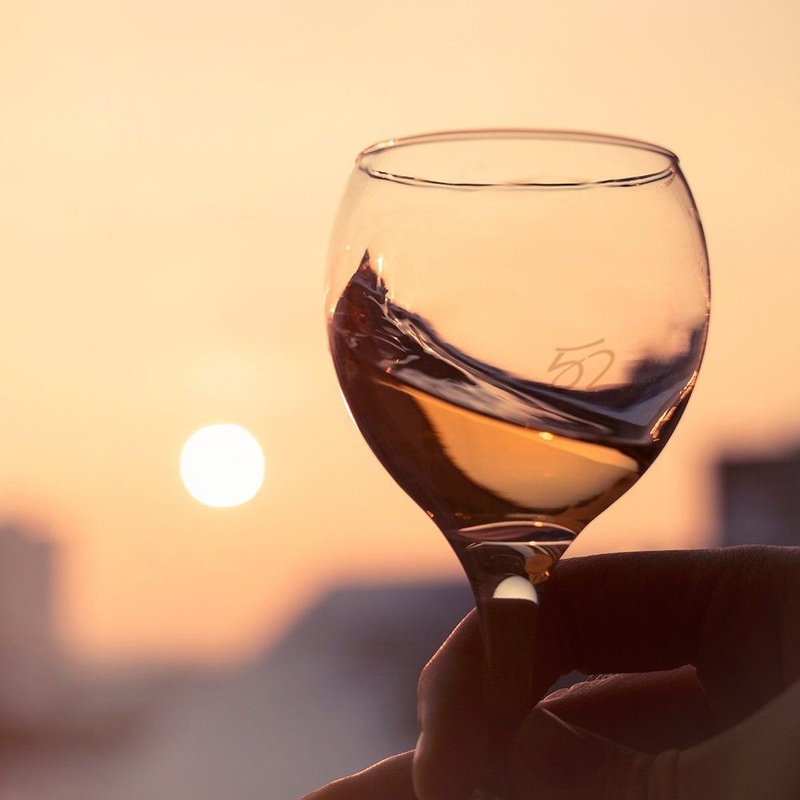 In addition to the standard varietals you will find Petit Syrah, Grenache, Dornfelder (a rare German red), Moscato, Albarino, Gruner Veltliner, Viogner, Chenin Blanc and other wines that you don’t see everywhere on average wine lists. All of those categories have at least one wine available by the glass. This is one of the few wine lists in Florida where I have seen a New York State wine, a Cabernet Franc from Long Island. There are also specials that are not on the list, so ask your server about them. Wine trends are noted and responded to. Look for Sicilian reds and Greek whites to appear on the list shortly. Miliotes puts a great deal of effort into the wine program. He looks for unusual small producers that he can work with. He has some sort of relationship with all of the producers represented on the list, and a number of them are very close. The entry level Chardonnay is Indaba from South Africa. 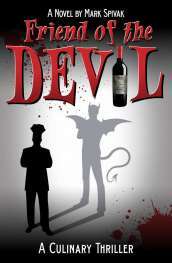 He consults with the winery to have a customized wine produced that is blended to American tastes. He gets an attractive wine, and they get a product that is more marketable in the US. He has also had a long term relationship with Selbach, a German producer of Rieslings. He is in constant communication with all his suppliers and gives them forecasts 6 and 12 months out. This helps him get the wines he wants at the price point he wants. A particular effort is made to ensure that the more expensive wines on the list show commensurate quality. In other words, you get the appropriate value for what you pay. This is harder to do at the high end of the list than it is for the entry level wines; most of the higher priced wines are sourced from overseas. as it tends to be difficult to get the right price/quality relationship with California wines. The prices of bottles range from the low $20s to a few in the $60s, with everything in between well represented. If you are looking for a special wine there is also a reserve list with 50 wines mostly in the $100-200 range, but which go up to $400 a bottle for a Chateau Monbousquet St Emilion ’01. The wine program effort extends to staff training. All managers of Seasons 52 restaurants go through the entry level master sommelier class and some go beyond that. There is a two week training program for servers, and one to two hours each day is dedicated to wine. They taste all varietals and learn how to serve and pour wine. They are given access to a DVD that tells them how wines are made, goes over the different varietals, and discusses how to pair them with food. Each server has a handheld device which you may see them looking at. These contain information on all the wines on the list including sweetness/dryness, weight, possible food pairings and general talking points. There are informal staff tastings constantly, and the servers are encouraged to taste everything on the list. As their wine knowledge evolves they are given little gold pins. To be a successful server at Seasons 52, you have to have a considerable knowledge of wine. 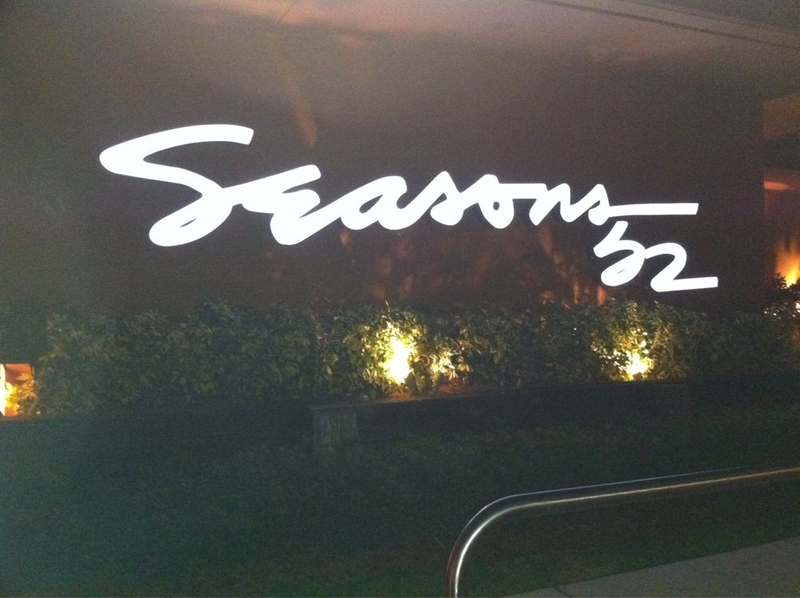 Seasons 52 is based on a bet that wine is ready to explode in Florida and elsewhere in the US. I doubt that Darden is creating a new restaurant with plans to only open a few in the South. They clearly want to be a leader in making good wine accessible in the casual dining category. They believe that wine education is a part of their mission, and that many people want to learn more about wine while having a good meal. In my view they are really on to something, and are executing very well on their vision. The existing restaurants are already quite popular and reservations are definitely recommended. Seasons 52 is a blueprint for restaurants in the 21st century. Have you been to Seasons 52? What was your experience like? Do you agree with this review? Share your comments and insights with the community!